By buying this product you can collect up to 14 loyalty points. Your cart will total 14 loyalty points that can be converted into a voucher of $5.60. This entry-level design Shisha comes with 1 hose port and has all necessary adapter included to hook up silicon hoses and/or normal hoses. There are also no grommets needed due to perfect, airtight design. You will not need a hose connector to connect a silicone hose. 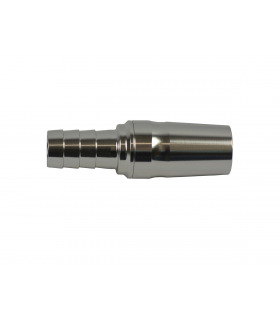 The Shisha has an integrated cut adapter between ashplate and stem, meaning you can easily connect molasses catchers and similar similar. The Shisha is lightweight due to the aluminium material, and comes with a click system (stem clicks into vase, lower stem clicks into upper stem). Rookie is a mix of traditional and modern. Modern design paired with a traditional closed-chamber system for a smooth draw and purge, with a little bit smaller inner dimensions than usual for modern Shishas to replicate the traditional feel. Read more about the Rookie Series here.